Advanced Spinal Care Low Back Pain: Where Does It Originate and Can It Be Helped? Low Back Pain: Where Does It Originate and Can It Be Helped? Low back pain can be distressing and uncomfortable, even intruding on your everyday life. If the pain radiates through the hips, buttocks, and down the back of your leg, you probably are suffering from sciatica. 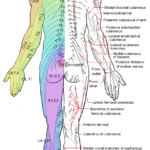 The sciatic nerve is about the size of the small finger, making it the largest nerve in the entire body. 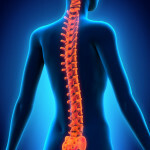 It is made up of nerve roots that come from the spinal cord in the low back. Low back pain due to sciatica can be blamed on a problem with the discs of the low back, putting stress on the sciatic nerve. It can also be attributed to arthritis in the low back and bone spurs. For sciatica, the focus is usually on relieving the symptoms and doing particular exercises to relieve the pain. Some people resort to anti-inflammatories or use ice on the sore spots. This is good to provide temporary relief; however, for a lasting solution, the root cause must be addressed. You may not even realize it, but if your upper neck is out of alignment, you may begin to notice more problems with low back pain and sciatica. This is because the alignment of these bones determines the posture for the rest of the spine. The atlas (C1) is located at the top of the neck and supports your head. If it moves out of place, even slightly, the entire spine compensates by twisting and shifting. This leads to spasms and unequal muscle tension and will eventually cause issues with the muscles and bones of the lower back. Here at Advanced Spinal Care in Redwood City, California, we use a method that is precise and gentle to realign the upper neck bones. We are not required to pop or crack the neck or spine to get positive results. Rather, the bones realign more naturally, allowing the muscles to heal and the pressure on the vertebrae of the low back to be relieved. This often leads to a reduction in the symptoms of low back pain and sciatica.